Estimated at being 2,500 years old, the discovery of a circular labyrinth was made only a year before of an ancient labyrinth design by two researchers that was observed in our exploration for yesterday. This design may be 500 years older and sits at approximately 700 square feet in area, making it another megalithic reward. 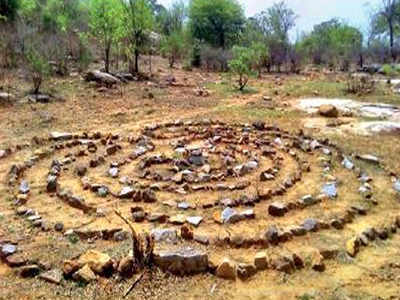 This labyrinth is located only two hours north of the other ancient labyrinth in the forested town of Horus in the Krishnagiri district of Southern India. It is a place where gardens are not overrun by rabbits, but trampled annually by elephants to give some perspective of the area and Indian culture. This circle of stones was found in a simple and obscure community used unknowingly in ceremony and ritual by its members adopting it in a prayerful way and adding it to their way of life. Its natural wonder and wisdom must have appealed to the community to simply adjust by using it and thereby gaining in understanding rather than clearing it in the name of progress. The labyrinth existed before any of its inhabitants giving it a sense of greater appreciation and respect perhaps. Explore what you have learned to adapt to instead of change and how it has made you more as a result.